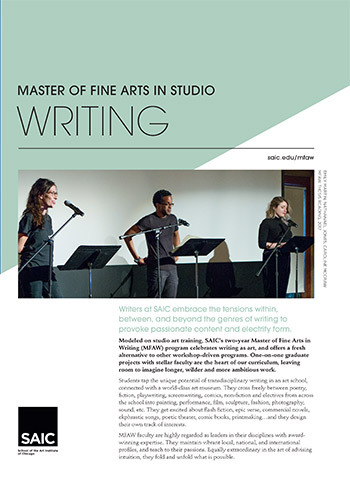 The Master in Fine Arts (MFA) in Writing welcomes writers of all genres—fiction, nonfiction, poetry, and playwriting—as well as visual artists who work with language as an integral component of their practice. The two-year program provides a rigorous yet flexible curriculum to challenge and accommodate individual explorations of process and form. If you are ready to apply to the School of the Art Institute of Chicago’s (SAIC) Master of Fine Arts (MFA) in Writing, you will need to first submit SAIC's Graduate Application form and then a corresponding ePortfolio for the Writing department. ePortfolios are required for each additional program to which you wish to apply. All submissions happen via the software SlideRoom. Admission to SAIC is for the Fall term only. SAIC requires applicants to apply online. Filing an online application requires a valid credit card and a current email address. You may apply to up to three programs with one application and fee. If you are applying to either the MFA in Studio or the Post-Baccalaureate Certificate in Studio you may select up to three departments of entry. Applications must be submitted prior to 11:00 p.m. (CST) on the appropriate deadline. Questions? Contact the Office of Admissions at gradmiss@saic.edu or 800.232.7242. When you click the "submit" button on your the Graduate Application form, you will be prompted to enter credit card information to pay the application fee. Your application form is not fully submitted until you have entered your credit card information. Under no circumstances will an application fee be waived or refunded. After you submit the application form you will be directed to a dashboard where you can begin working on your ePortfolio(s). Application fees will be discounted by 50% through December 1. During the application process an unofficial transcript is acceptable for review pending an Admissions decision. Official transcripts are required upon admission. Include transcripts both official and unofficial from all universities/colleges from which a degree was obtained or prerequisites were fulfilled. You can attach unofficial transcripts as .pdf or .jpg files in the Educational History section of the application form. If you are in the process of completing a bachelor's degree when you apply, a transcript showing your first three years of study is acceptable. Transcripts are considered official if sent directly from the degree- or credit-granting institution to the SAIC Graduate Admissions Office. Hard copy transcripts are considered official if the documents remain in the registrar's original signed and sealed envelopes. You must upload a 500- to 700-word statement of purpose that describes your writing or research. Discuss how you came to focus on writing at the graduate level, as well as why you are interested in SAIC for your graduate education and what you hope to gain from your time here. Please include a short description of your reading practice and interests. Upload your statement of purpose via your ePortfolio. You are responsible for securing two letters of recommendation from persons who are qualified to write about your potential for success at SAIC. If you are currently a student or are a recent graduate, we recommend you request letters of recommendation from current or former instructors. Letters of recommendation should be submitted electronically via the References section of the application form. In this section you will be asked to provide an email address for each of your references. Once you click "send request," an email will be sent from SlideRoom to your references with instructions on how to submit their recommendations online. If your references are unable to provide an online recommendation please contact the Graduate Admissions office at gradmiss@saic.edu. Applicants are required to submit an ePortfolio. You must submit a separate ePortfolio for each program or studio department to which you apply. After you pay the application fee and submit the application form, an ePortfolio for each of the programs you selected in the application form will automatically appear in your SlideRoom dashboard. The Writing department conducts interviews by invitation only. Applicants who pass the preliminary review will be invited to schedule an on-campus interview in February. Notification will be sent by late January. A current résumé is optional. You may upload your résumé to the Attachments section in your ePortfolio. If you do not meet one of these conditions, you must submit official English language proficiency test scores. You are strongly encouraged to schedule a language proficiency test appointment as early as possible in order to receive official test scores prior to the application deadline. SAIC accepts official scores from both Test of English as a Foreign Language (TOEFL) and International English Language Testing System (IELTS). The TOEFL Institution Code for SAIC is 1713. Please upload an unofficial copy of your test score results to the International Requirements section of the application form. For more information about the TOEFL, please visit here. For more information about the IELTS, please visit here. Official test scores that meet the minimum requirement must be received by the application deadline. Transcripts are records of your studies that list the courses you completed, the grades received, and provide evidence of degree conferral. They may include grade sheets, exam results, final diplomas, degrees, or graduation certificates. Official copies are issued in the original language directly by your university. Copies must bear the official stamp or seal of the institution, as well as the signature of the appropriate official such as the dean, rector, registrar, controller of examinations, or office of teaching affairs. Photos, notarized copies, facsimiles, or email transmissions are not acceptable. Official translations are expected for all educational documents issued in a language other than English. A translation agency or university language department should issue official translations typed on official stationary and the translator must attest proficiency in the original language and indicate their translations are accurate word-for-word. A conferred four-year baccalaureate degree or its equivalent is required for admission to all graduate programs at SAIC. Students may elect internships to satisfy up to 6 hours of elective credit. Completion schedule: Students have a maximum of four years to complete the degree (this includes time off for leaves-of-absence). Transfer credits: A minimum of 45 credit hours must be completed at SAIC. Up to 15 transfer credits may be requested at the time of application for admission and are subject to approval at that time. No transfer credit will be permitted after a student is admitted. Thesis requirement: During their final semester, students are required to submit a thesis of appropriate length in any genre. Exhibition requirements: MFAW students planning to participate in the Graduate Thesis Exhibition or Time Arts events are required to complete at least 6 studio credits by the end of the third semester AND to advise with a studio faculty member in their final semester. Studio space: Individual studio space is not provided automatically to students in the MFA in Writing; however, Writing students with a visual arts practice in addition to their writing may apply for a space through the Administrative Director, Graduate Division, at gradstudio@saic.edu. Graduate Projects: MFA 6009 Graduate Projects enrollments must be in increments of 3 credit hours. No more than two advisors and a total of 6 credit hours may be scheduled for a given semester. The number of credits earned by the student has no correlation with length or frequency of the advising sessions or to faculty assessment of student work. Graduate Projects are the heart of the MFAW. Modeled on the tradition of artists’ studio visits, MFAW students meet one-on-one with faculty advisors who offer intensive, focused insight and feedback on independently driven projects. Students may work with advisors from both within the Writing Program and across the School to expand the critical vocabularies that are pertinent to their practice. Workshops might focus on process, or on a specific topic or literary theme, for example, Process/Project, Narrative Design, Text in Space and Literary Animals. Workshops may include interdisciplinary participants who help to foster creative workshop methodology and innovative in-class exercises. Seminars stretch across genre to present models and histories of literary practice and frequently include a generative, creative component. Current seminars include Code Switch & Reclaim, Systems of Writing, and Literature of the Senses, among others. Electives offer students an opportunity to engage with interdisciplinary study in the context of an acclaimed school of art and design. MFAW students are encouraged to work with their advisors to develop a plan that takes advantage of adjacent fields of study, such as performance, film, sculpture, arts journalism and art history, as well as many other possibilities, to best support their continued growth. Thesis is the major creative project that all MFAW students submit during their final semester. There are no restrictions on genre or content--for some, it reflects an overall plan and design of a finished book; for others, it’s a means of documenting their graduate work and/or process; yet others use it as an opportunity to put together a collection that adopts variant strategies in relationship to their engagement with interdisciplinary work. Please visit the SAIC Thesis Repository at the Flaxman Library to view recent MFAW thesis abstracts.